Welcome to my most recent post. I have just uploaded my new video to YouTube and I hope it gets lots of views. I wish I knew the formula for getting my videos to show in watch lists. Sigh! I used a Cottage Cutz Harvest Owl die that I have had for years and have neglected of late. 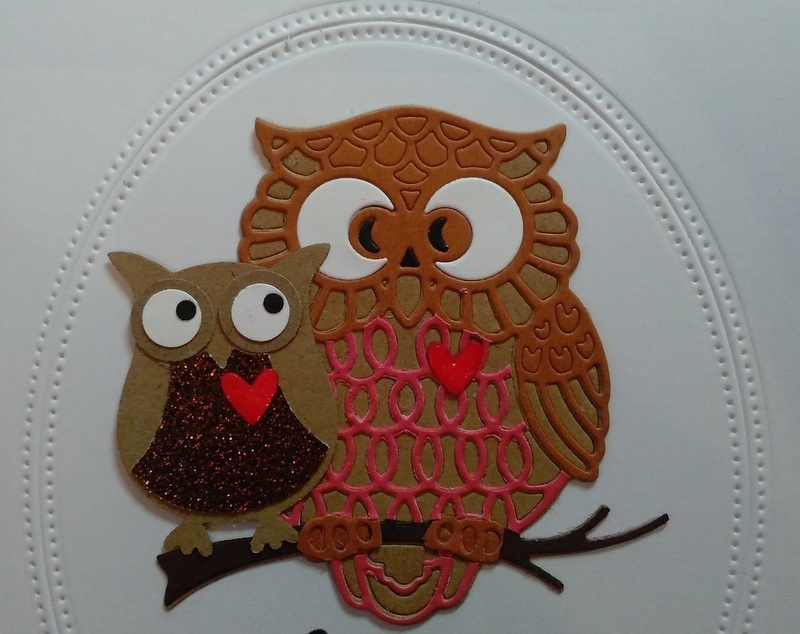 I teamed it with an owl made with the pieces punched from the Stampin Up! Owl Builder Punch. 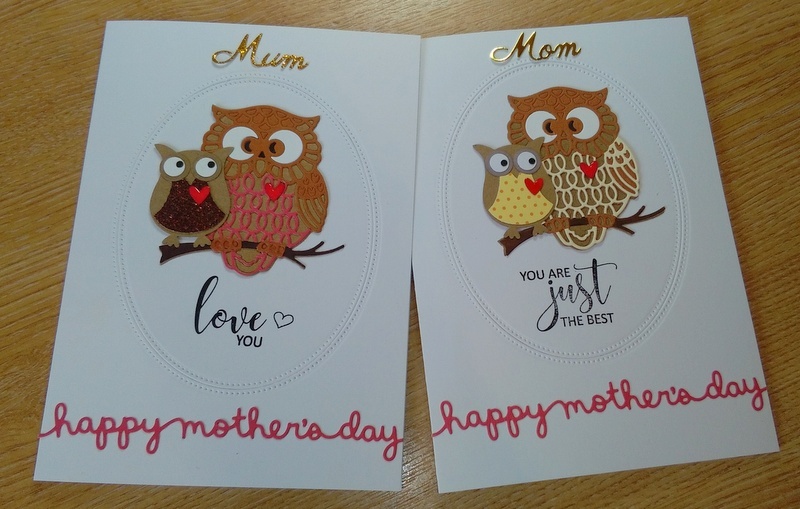 Together they make a really cute critter representation of the bond between mother and young! The Harvest Owl is very intricate but when I bought it first it cut brilliantly, even in my hand-cranked Cuttlebug. But I made a HUGE (and expensive!) 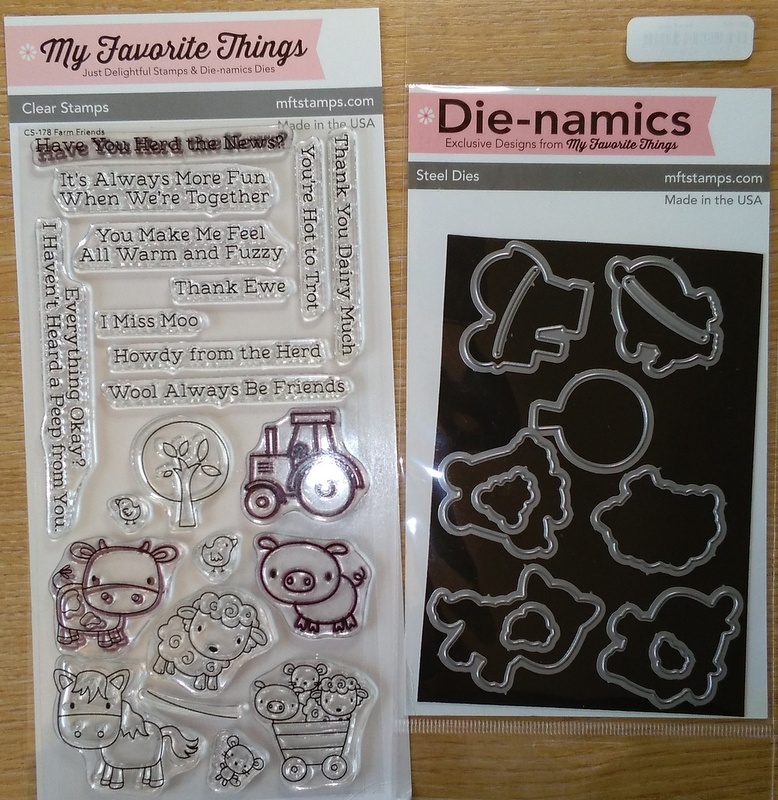 mistake when I used the wrong sandwich in my electronic eBosser and I damaged several of my dies when I let the cutting edges of the dies come into direct contact with the metal plate 😦 DON’T DO IT!!! Fortunately, using the correct sandwich i.e. placing the metal plate under the magnetic shim, allows this gorgeous owl die to still cut well in the electronic cutter. This entry was posted in Uncategorized on March 4, 2017 by craftycardsaor. Hi, welcome to Úna’s Craftycards blog. If you haven’t come here from YouTube, you might like to watch the video linked below. 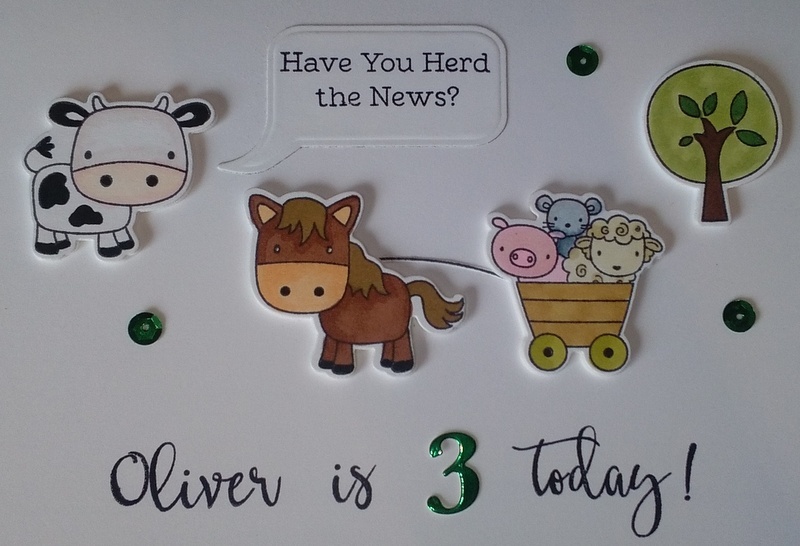 I stamped the My Favorite Things ‘Farm Friends’ farm animal and tree image on Neenah Solar White cardstock with Memento Tuxedo Black because that cardstock is really good with alcohol markers and the Memento ink does not bleed. Other dye inks can smudge or bleed into the colouring. The co-ordinating dies are so handy! 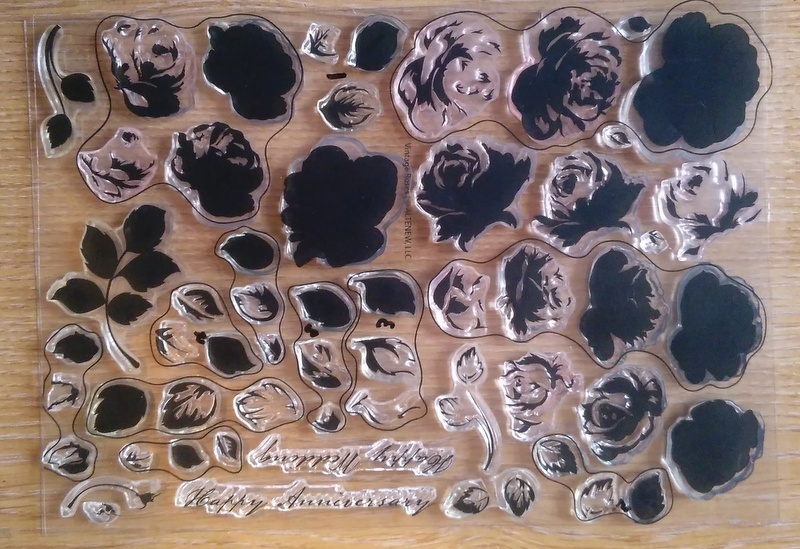 As well as being able to cut the images precisely, I love the clean lines of the perfectly aligned dimension I was able to add to the images by backing them with die-cut white funky foam. I have a swatch strip on the top of each packet so that I can see the true colour at a glance. Price was the deciding factor when I decided to invest in a set of 72 Spectrum Noir markers. I watched other crafters’ videos enviously as they coloured with their Copic markers. But then I discovered Spectrum Noir markers in David Walsh’s shop in Dungarvan and didn’t look back. At €8.50 for a pack of 6, they are really good value. I do wish they had a brush tip but I manage without it. The chisel tip can be replaced with a brush tip but they cost £4.99 for a pack of three. By the time that is converted to euro and postage is added on, there would be huge expense involved in replacing all nibs. I think I will however invest in a few packets, so that I can have brush tips on the markers I use for colouring hair and skin, as blending is really important to achieve a good result. 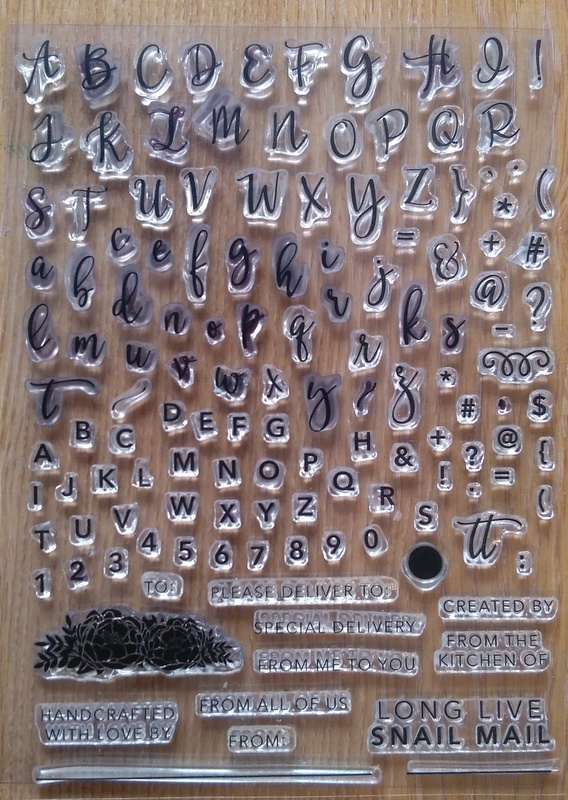 And of course, there is my addiction to stamping with Concord & 9th’s Perfectly Penned set. There is something so satisfying about stamping and linking the letters to create a script that looks very attractive. 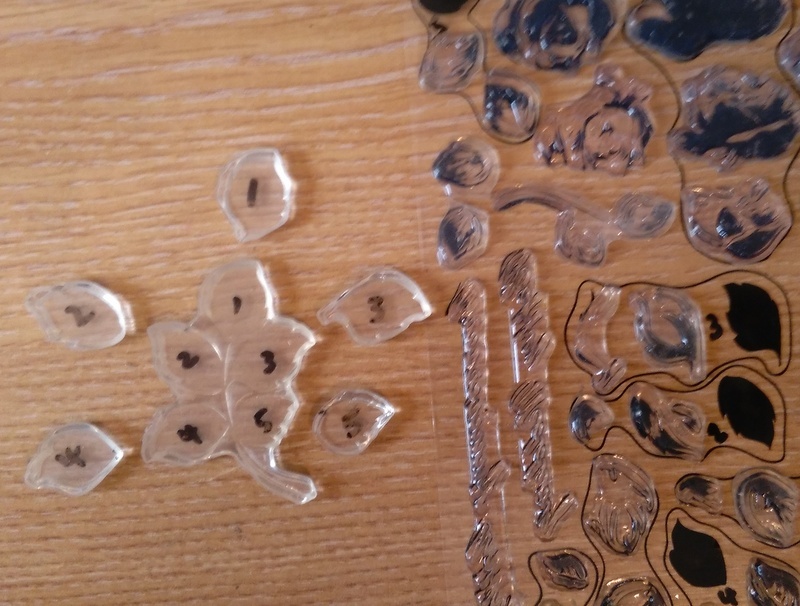 I used a Cuttlebug to die-cut the images. 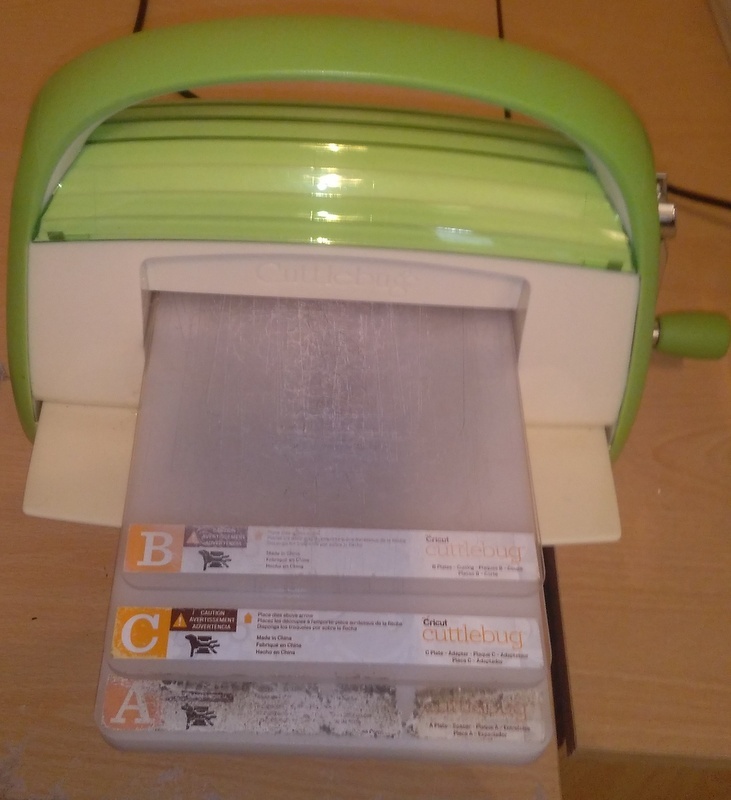 The sandwich is from bottom to top: A plate, C plate, die (cutting side up), cardstock, B plate. I keep my C plate clean but my B plate is very scratched. Scratching is no harm but you don’t want the scratched plate coming into contact with the image surface as the fine scratch lines will transfer to the paper or card. I hope you enjoyed the video and that you’ll want to watch more in the future. If you haven’t subscribed, please do so and my new videos will appear in your YouTube feed. All comments and questions are welcome. This entry was posted in Uncategorized on February 25, 2017 by craftycardsaor. 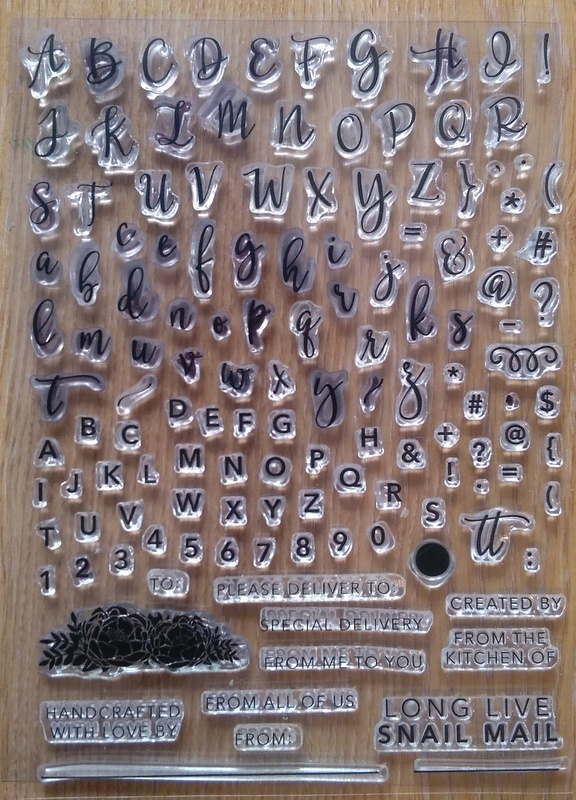 Altenew layering stamps are just so gorgeous to work with – they make you feel like an artist! 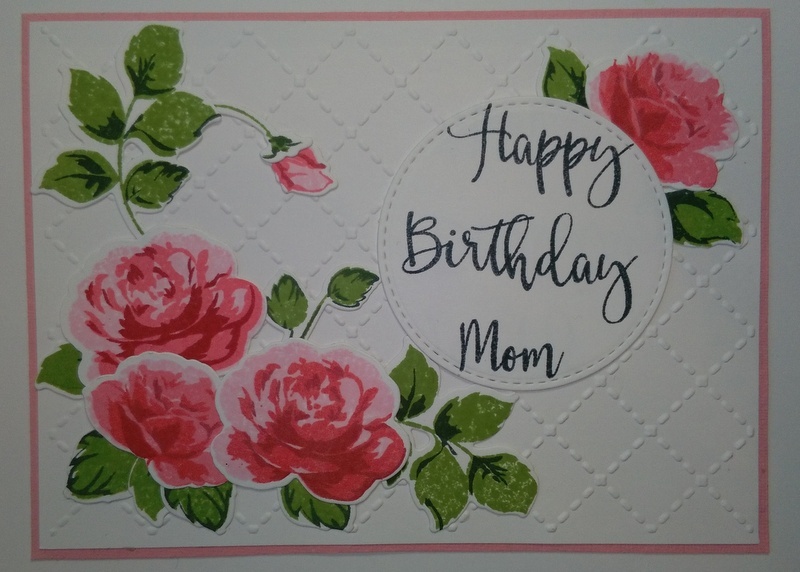 The Vintage Roses package which I use in this video contains 3 sets of 4 layering stamps and 2 sets of 3 layering stamps making 5 different roses. I use shades of pink and red but you can create roses from any colour family. Your imagination is the only limit … not the natural world! 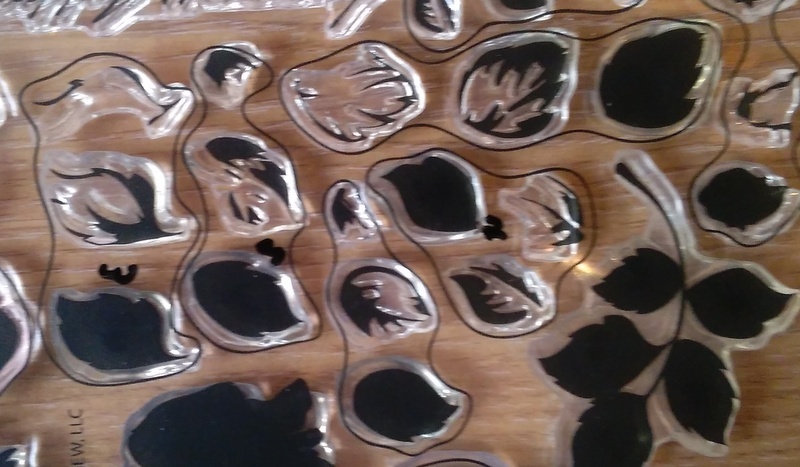 The leaf stem has five leaves on it and each of those leaves has its own background stamp and two layering pieces. I numbered mine to make finding the layering pieces easier. 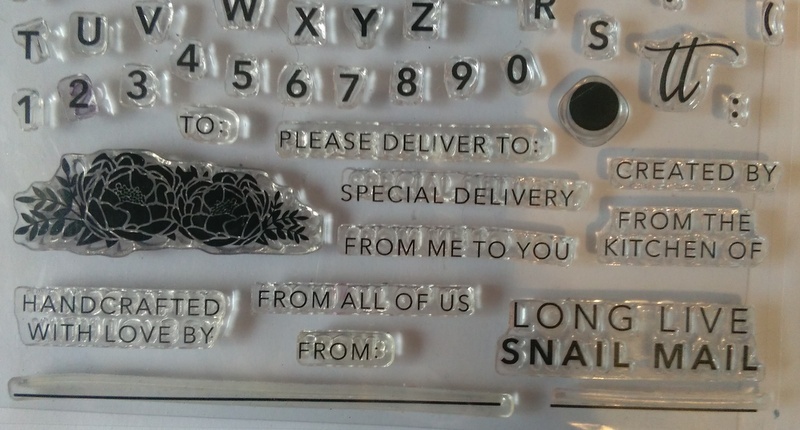 There are just so many stamps in this set!! This Perfectly Penned set lives up to its name 🙂 With very little effort you can add stylish handwriting to your projects. This entry was posted in Uncategorized and tagged altenew flower stamps, altenew stamps and dies, altenew vintage roses, úna, card makers, card making blogs, card-making videos, Distress Inks, etsy.com/shop/craftycardsaor, layering stamps, making simple easy cards, memento inks, stamping and diecutting, unascraftycards on February 12, 2017 by craftycardsaor.